With three weeks of spring practices under their belt, the Ducks have seen vast improvements from their young quarterbacks. Frost mentioned that the team is competing at a much more intense pace and he also believes that the rust is starting to fade away. As Frost continues to work with the young nucleus that Oregon will have intact for next season, it wouldn’t be a normal day if the Ducks’ offensive coordinator wasn’t asked about Marcus Mariota. 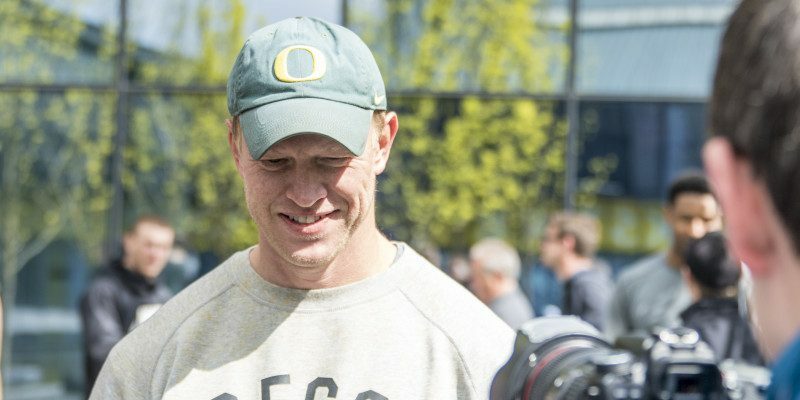 With the NFL draft looming right around the corner, Frost believes that most NFL executives have all the information they need about the Ducks’ former quarterback. 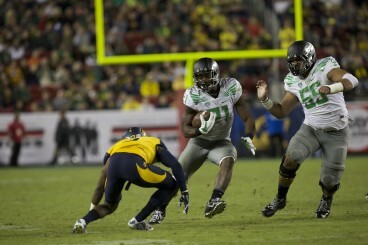 Oregon’s coaching staff expects Royce Freeman to be more of a leader next season. It’s no secret that the Ducks lost a plethora of key players after the season ended, and while there may be a temporary void in the leadership department, Oregon’s coaching staff believes that one of its returning players can step in and fill that void. Royce Freeman, who was responsible for 20 touchdowns while also being named a freshman All-American last year, has been more vocal in practice this spring. Frost believes that his running back is ready to take that next step. The Ducks will return to the practice field on Friday.